Can AI judge our State of Happiness? 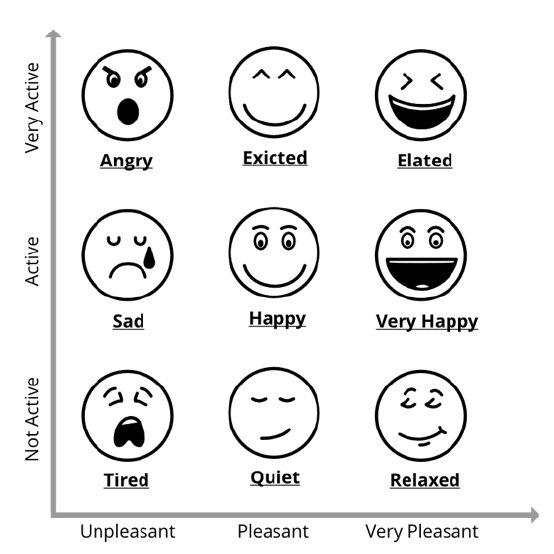 Next to business applications, emotion and mood sensing also provides input data utilized in the emerging field of personal analytics, empowering individuals to analyse and exploit their own data to achieve a range of objectives and benefits across their professional and personal lives. Emotion and mood sensing can provide a bridge to mind-controlled feelings in the form of interactive, machine learning dialogs enhanced by empathy. The increasing demand for psychotherapy and self-development coaching has spurred a wave of new digital services aimed at this market with Apps like ‘MoodScope’ or ‘SAM’ (self-help for anxiety management). Even though AI systems are no substitute for interactions with a real human, they could have the potential to improve our quality of life and enhance our emotional intelligence. Especially at a time when proactivity and constant self-development are becoming a precondition for success, virtual therapy and coaching can be expected to continue gaining popularity. The ‘happimeter’ app is a new player on the block of personal analytic service providers. New is the combination of a smart watch with a smart phone and the focus on happiness with an algorithm that executes input data provided by the sensors of the smart watch combined with environmental information from the smart phone. According to Wikipedia Happiness is a fuzzy concept. Some related concepts include well-being, quality of life, flourishing, and contentment. In philosophy and (western) religion, happiness may be defined in terms of living a good life, or flourishing, rather than simply as an emotion. In psychology, happiness is a mental or emotional state of well-being which can be defined by positive or pleasant emotions ranging from contentment to intense joy. Most of us probably don’t believe we need a formal definition of happiness; we know it when we feel it, and we often use the term to define a range of positive emotions, including joy, pride, contentment, and gratitude. Likewise, we also can describe negative emotions related to unhappiness such as sadness or anger. Intrinsic personal and environmental data acquired by the smart watch and smart phone is separated into activation and pleasance categories. For example, it was found that weather data (Cloudiness, Temperature, Air Pressure, Humidity, Windiness) exerts a strong influence on mood. With the ‘happimeter’ app users can track how they feel and how happy they are for extended periods of time. Through machine learning algorithms, they will get regular reports with insights about their happiness as well as the factors that influenced the happiness. The system also provides simple suggestions, for example ‘get more sleep’, if stress is detected. To increase the accuracy of the prediction model, users can also do a standardized personality test (Neo-FFI) to define their personality characteristics. In a team-setting, where every participant is equipped with a ‘happimeter’, the system tracks work group mood/interactions to provide information about the team’s level of satisfaction with the meeting. The researchers claim to achieve a prediction accuracy of up to 94% correlating one’s own perception of happiness with the prediction-model based on data acquired by smartwatch and smartphone. However, one limitation of this research so far has been the small sample size (60 participants that made frequent mood inputs and 33 that filled out the personality and personal data questionnaires, (Neo FFI-Test)). Also, there might be selection bias in that the participants were people interested in happiness research. Therefore, the research team suggests replicating the experiment with a larger selection of randomly selected samples, including people of different ages and coming from more heterogeneous groups. It can be questioned whether the ‘happimeter’ represents a valuable tool in the quest towards happiness. To some people it might provide an additional level of insight in respect to their own state of happiness, to others it might foster the idea that the path towards happiness is to self-reflect and to apply this unique human asset of consciousness to their own benefit. One widely voiced issue with emotion and mood monitoring relates to the protection of privacy. Despite the newly established data protection regulation in the EU, one hesitates to release sensitive, personal data to public cloud applications as trust has been dealt a severe blow, following the Facebook/Cambridge Analytica scandal. Another issue relates to deep learning, which today represents the most successful branch of AI. Its reliance on advanced mathematics will possibly fail to provide useful guidance in individual human related issues due to its own analytical limits. In a paper published in January 2018, Gary F. Marcus Professor in the Department of Psychology at New York University and Founder and CEO of Geometric Intelligence, a machine learning company later acquired by Uber, states that “deep learning is only part of the larger challenge of building intelligent machines. Current deep learning technology lacks ways of representing causal relationships (such as the relationship between diseases and their symptoms) and it is still far away from integrating abstract knowledge, such as information about what objects are, what they are for, and how they are typically used. There remain many areas, from understanding natural language to common-sense reasoning, in which humans still retain a clear advantage”. We don’t yet know enough about neuroscience to literally reverse engineer the brain and may not be able to do so for several decades. However, it should be possible to use techniques and insights drawn from cognitive and developmental psychology, to build a more robust and comprehensive artificial intelligence, with models that are motivated not just by mathematics but also by clues from the strengths of human psychology. A good starting point might be to first try to understand the innate machinery in human’s minds, for example by focusing on how infants’ minds represent notions such as space, time, and object. A second focal point might be on common-sense knowledge, both in how it develops, how it is represented, and how it is integrated on line in the process of our interactions with the real world. Today’s deep neural networks can translate text, but these systems do not understand its context. To map human diversity requires more than highly advanced mathematics. A contextual model of AI must combine perceiving and learning as one set of tasks, while abstracting and reasoning defines the other set. The application of deep learning has proven to be very successful as long as well-defined datasets are available to solve a specific problem. The ‘happimeter‘project evokes the question if AI’s current development path is approaching a brick wall. On December 18, 2017, François Chollet, software engineer at Google and author of the Keras neural network library, made the statement, that for most problems where deep learning has enabled transformationally better solutions (vision, speech), we entered diminishing returns territory in 2016-2017. Geoff Hinton, Professor at the University of Toronto, considered the grandfather of deep learning, recently made the statement that “Science progresses one funeral at a time. The future depends on some graduate student who is deeply suspicious of everything I have said”. The application of ‘narrow AI’ to solve specific problems with highly advanced statistical methods using neural networks, is demanding legions of highly qualified mathematicians and IT experts, disrupting existing salary structures and causing a new digital divide within our society. As this wave eventually settles, AI might face another ‘winter’ as historically happened before. Considering the exponential speed of change, this might happen sooner than we imagine. Subscribe to the latest News, Essays and the Dynamic Reference Book.